At SACHI's, we manufacture and promote GREEN, RECYCLABLE and SUSTAINABLE products! We also teach POTTERY, ART, CRAFT & DESIGN APTITUDE! The studio is open for anybody who would like to connect to the soil, meditate, experience art and craft, or even shop for gift-goodies and/or chat over a cup of tea/coffee!!! We offer small lifestyle accessory products that are both usable as well as decorative! So while adding value to your home/office/work-space decor, they also serve valuable purposes!!! We work with a variety of materials including TERRACOTTA, GLASS, SILK, JUTE, CANE, etc. Long and monotonous hours in a well-known IT Company made this software engineer believe that the job was not meant for her. In 2004, the software engineer Sachi, left her job and joined the National Institute of Deign in Ahmedabad to pursue a Post Graduation in Industrial Design, specializing in Glass & Ceramics. 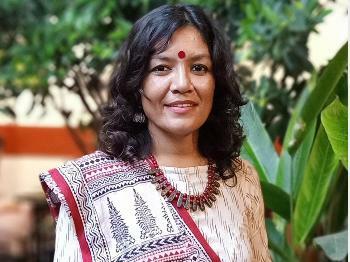 Almost a decade later, she's a Design Consultant and Educator, providing design solutions to clients, as also teaching design aptitude and arts & crafts at her studio in Dwarka, New Delhi. She also paints, and handcrafts her lifestyle accessory products in materials varying from terracotta, glass, cane, wood, bamboo, jute to silk! Earth Songs, Art Junction, The Lalit, New DelhiAnnual Potters Haat by the Delhi Blue Pottery Trust, at Sanskriti Kendra, Anandgram, Delhi. I'll typically ship within 5 days through reputed couriers. Please do not accept the consignment if it appears tampered. Some of my products are fragile and I may not be in a position to courier in which case please refer to item page to check if the item can be couriered or not. The nature of my products does not allow me to provide replacements. However, your satisfaction is important, so please get back to me within 3-5 days of receipt with images and details should you have any concerns for me to review, and I shall be happy to help. All products are handmade and therefore, usually available in single, or a few units. However, bulk orders of 10-50 pieces can be processed and delivered within three weeks of time. Large quantities of huge items like murals/panels will take a little more time depending on the order.